I have decided to melt solder once more and build another QRP radio. This time it’s a Softrock RXTX v 6.3 that Wal, VK4CBW gave me. He said his eyesight doesn’t allow him to tackle such projects anymore. The kit is fairly complex as one would imagine and although this particular model is now no longer in production, there is still detailed build information on the internet. The first stage of the build involves constructing the power supply section. This contains many surface mount components, which are tricky to install due to their small size. First to do was to install the board mounting hardware that consisted of nuts, bolts and spacers. Then it was a matter of those pesky little capacitors: eight 0.01 uF caps and eighteen 0.01 uF caps. The SMT caps all soldered into place. Next came U5, the tiny 3.3v regulator. At first I couldn’t find this item it was so small. But after about 20 minutes of searching, I noticed it tucked away in a fold of the anti-static bag the ICs came in. Phew. That’s U5 nestled in among the SMT caps. Notice the liberal amount of flux I used just to help the parts ‘stick’ in place prior to soldering. I am taking this project nice and slowly so will post regular updates as I go along. The final part of the upgrade to my Elecraft KX1 involved building and installing the internal antenna tuning unit. The kit is remarkably small; it comes in one plastic zip up envelope together with a concise and well put together 12 page Assembly and Operating Instructions booklet. It also contains a note telling you who put the kit together, which is nice and reassuring. If anyone is willing to put there name to something, there must be good reason! Confidence that no parts are missing is my guess, and I think I’d be right because none were. This, of course, isn’t generally the case with electronic kits, as most builders would know. The kit was very easy to build and align. The instructions are excellent and leave nothing to chance. I found winding the three coils and one transformer easy to do too. As the KX1 is a small, compact piece of gear, the ATU needs to fit in without touching other components because if it does, the back of the enclosure won’t fit properly. This is one reason both sides of the PCB are used. The yellow relays are on one side of the board while other components nestle underneath. The only ‘snag’ I ran into (I always tend to make things more difficult for myself) was when it came to installing the mating male connectors. I misread the instruction to ensure they were fully seated before soldering. I read that to mean the black plastic bodies needed to be fully seated on their female counterparts. So I slid them down further until they did with a pair of long nose pliers. This presented problems when it came to ensuring the ATU’s PCB seated properly, so I returned them to their original positions, soldered them in and all went together well. Fitting the ATU into the KX1. Alignment was easy to accomplish. All that was needed was a DDM and an insulated screwdriver. Time to put it all back together again. The ATU worked perfectly first time. This is a wonderful addition to the KX1 that adds to its functionality. Part of my Elecraft KX1 upgrade program involved adding the KXPD1 plug-in keyer paddle to the rig. I decided to do this as I like the idea of having one less component to worry about, especially when operating portable. And with the annual John Moyle Field Day only a week away, now is the time to get organised. I placed my order for the kit over the phone and it arrived in Australia in less than a week. The kit came well packed and with good instructions. Typical Elecraft. This was a rather simple kit to put together, being more mechanical in nature than electronic. I only had to use the soldering iron once to solder the wires to the 3.5mm stereo plug. This was also the most tricky part as you need to ensure that there are no short circuits. The space in the aluminium bracket where the soldering takes place is small and cramped. When all was together, it was time to run some tests. I plugged the keyer into the rig and turned it on. I immediately heard a series of dits and dahs in the headphones, indicating that something was wrong. I read through the instruction manual and found this case covered: there was a short between one of the plug wires and the bracket. But I knew this not to be the case as I had checked with my DMM beforehand and all was okay. So I read on and found the next test was to remove a rubber grip and see if that stops the noise. It did. So now I knew I had a build up of solder or something between the lever and contact wire. I pulled the lever apart and inspected it closely. There was a small bit of flux on the lever. That responded well to my finger nail and fell off. So I put it all back together again, slipped on the rubber grip and plugged it into the rig. I held my breath as I turned on the power and heard … nothing. Phew, all good. Now all I need to do is try out the keyer paddle next time I fire up the rig for the QRP net. My new KXPD1 keyer paddle all ready to go. 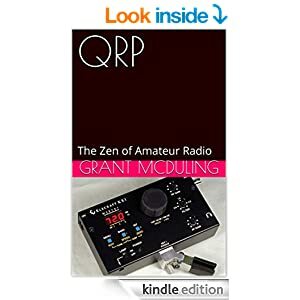 Having gone 100% QRP, I have decided to operate in the true spirit of doing more with less. That means all my radio work takes place on my deck, using battery power and as basic set up as possible. Since making the switch to QRP I have been operating on Tuesday nights with the CW Operator’s Club net on 7.028 MHz. My equipment so far has been the KX1 feeding 3W into a long wire antenna that I string up along the railings of my deck at my QTH. The long wire antenna is attached to the deck railing and works surprisingly well. The deck is up on the second floor of my house facing SE. I use a BLT Tuner to take care of tuning the antenna, a Whiterook paddle and a 2 Ah rechargeable battery. My operating position on my deck. From left: battery, KX1 with Whiterook paddle connected, BLT tuner. 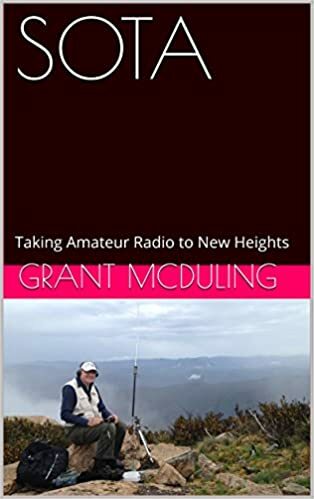 I have no trouble making good contact with operators in Sydney and Canberra and have worked into Melbourne too with this setup. But I need to maximise efficiency so have embarked on an upgrade. I have ordered an internal antenna tuning unit and the plug-in paddle as well as a Buddistick vertical antenna from Elecraft. That should arrive this week. I expect better performance once I’ve had a chance to build and install these pieces of gear.